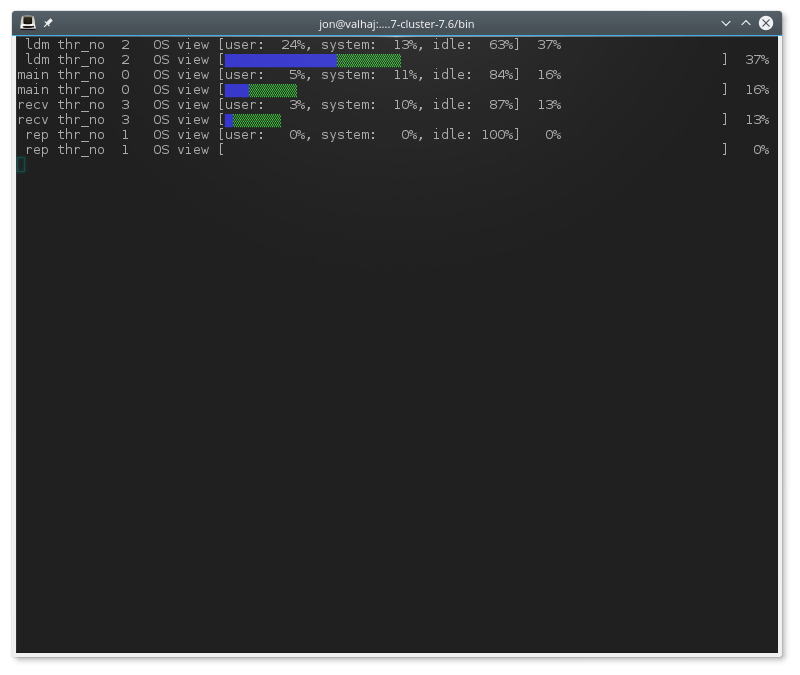 ndb_top displays running information in the terminal about CPU usage by NDB threads on an NDB Cluster data node. Each thread is represented by two rows in the output, the first showing system statistics, the second showing the measured statistics for the thread. ndb_top is available beginning with MySQL NDB Cluster 7.6.3.
ndb_top connects to a MySQL Server running as an SQL node of the cluster. By default, it attempts to connect to a mysqld running on localhost and port 3306, as the MySQL root user with no password specified. You can override the default host and port using, respectively, --host (-h) and --port (-t). To specify a MySQL user and password, use the --user (-u) and --passwd (-p) options. This user must be able to read tables in the ndbinfo database (ndb_top uses information from ndbinfo.cpustat and related tables). For more information about MySQL user accounts and passwords, see Section 6.2, “Access Control and Account Management”. Output is available as plain text or an ASCII graph; you can specify this using the --text (-x) and --graph (-g) options, respectively. These two display modes provide the same information; they can be used concurrently. At least one display mode must be in use. Color display of the graph is supported and enabled by default (--color or -c option). With color support enabled, the graph display shows OS user time in blue, OS system time in green, and idle time as blank. For measured load, blue is used for execution time, yellow for send time, red for time spent in send buffer full waits, and blank spaces for idle time. The percentage shown in the graph display is the sum of percentages for all threads which are not idle. Colors are not currently configurable; you can use grayscale instead by using --skip-color. The sorted view (--sort, -r) is based on the maximum of the measured load and the load reported by the OS. Display of these can be enabled and disabled using the --measured-load (-m) and --os-load (-o) options. Display of at least one of these loads must be enabled. The program tries to obtain statistics from a data node having the node ID given by the --node-id (-n) option; if unspecified, this is 1. ndb_top cannot provide information about other types of nodes. The view adjusts itself to the height and width of the terminal window; the minimum supported width is 76 characters. Once started, ndb_top runs continuously until forced to exit; you can quit the program using Ctrl-C. The display updates once per second; to set a different delay interval, use --sleep-time (-s). ndb_top is available on Mac OS X, Linux, and Solaris. It is not currently supported on Windows platforms. The following table includes all options that are specific to the NDB Cluster program ndb_top. Additional descriptions follow the table. Show ASCII graphs in color; use --skip-colors to disable. Display data using graphs; use --skip-graphs to disable. This option or --text must be true; both options may be true. Host name or IP address of MySQL Server to connect to. Show measured load by thread. This option or --os-load must be true; both options may be true. Watch the data node having this node ID. Show load measured by operating system. This option or --measured-load must be true; both options may be true. Port number to use when connecting to MySQL Server. Time to wait between display refreshes, in seconds. Use the specified socket file for the connection. Sort threads by usage; use --skip-sort to disable. Display data using text. This option or --graph must be true; both options may be true. Connect as this MySQL user.